Good post, but I can already see the eye rolls coming from Uncle Bradley’s target audience. “Who cares what happens in Europe, or the rest of the world for that matter? This is ‘Merica, dammit! Besides, didn’t we fight a war against the Germans, the Italians, the Japanese, and the Koreans? Why should we pay attention to anything they do?” Don’t try to confuse me with your facts; I just know that single mothers are the root cause of all our troubles. I wouldn’t count cohabs as completely equivalent in all countries – certainly not the US. So I didn’t know how to cut them. True. But if you adjusted for those nations where cohabitation is a functional equivalent to marriage (Scandinavia plus France, to begin with) the scatterplot in Figure 1 would look quite different. New Zealand, too, and possibly at least some Australian states, cohabitation would be functionally equivalent to marriage. Something is wrong with Figure 4. 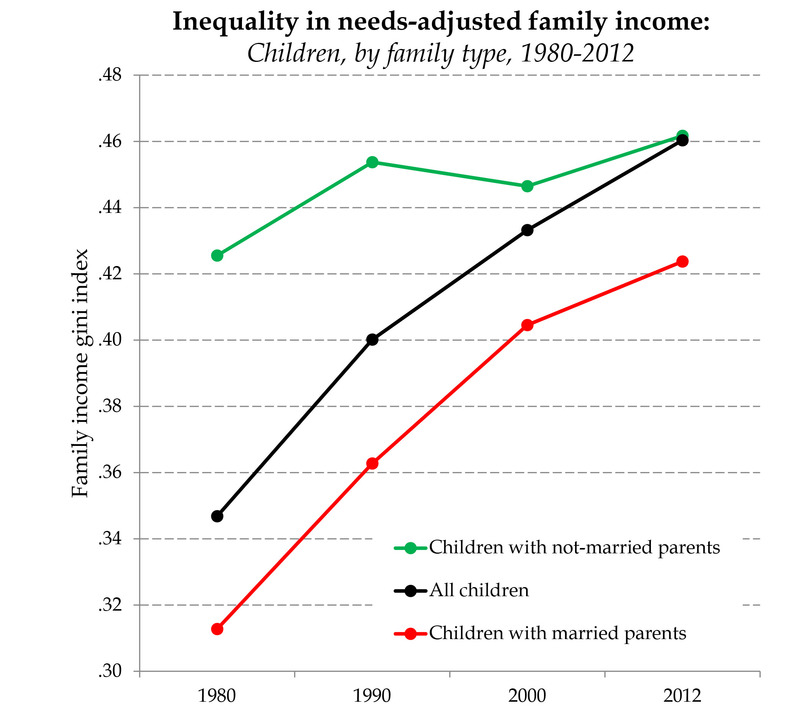 Why is the GINI coefficient of all children in 2012 same as that of children with non-married parents? 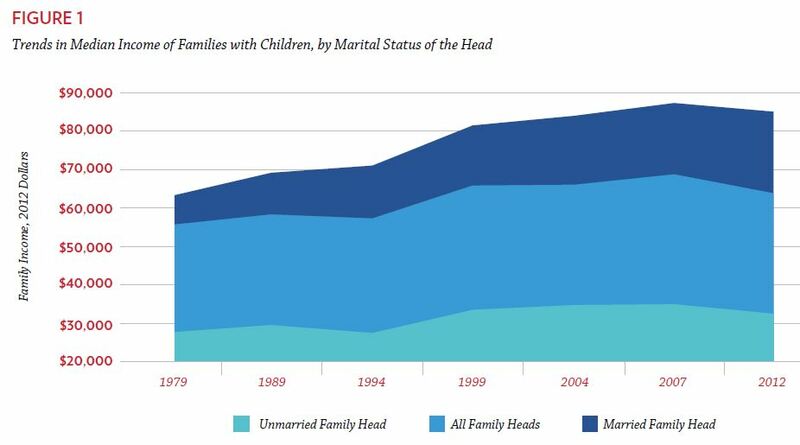 That implies that there are no children with married parents in 2012. Up to 2000, it looks reasonable, with increasingly more children married out of wedlock by year. In any case, this figure dos not demonstrate much. We know income inequality has suffered over the last thirty years. 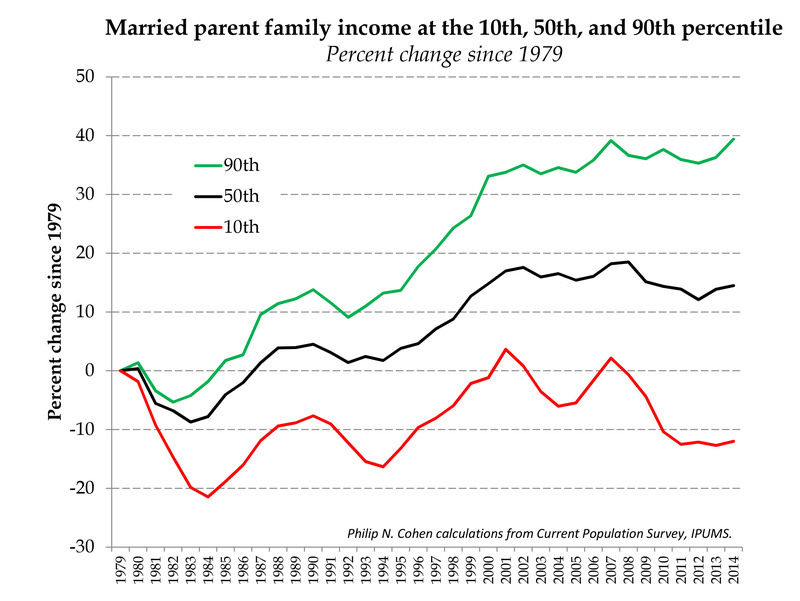 Has it gotten worse for unmarried families? What you need to do is to plot gini coefficient of married families, families with single parents, non-dimensionalized by all families, or the nation as a whole. Then, it is possible to argue one way or other. Figure 1 is particularly meaningless, givn we have almost nothing in common with japan; or Denmark; or Sweden; or Finland. Vijay – you don’t understand Figure 4. I suggest you have another look at the text. I did read it and do understand it (I think that you have a low perception of readers who are not in the academe). Read my comment back. If inequality among the families with all children is the same as the coefficient with non-married parents, something is wrong with your adjustment. We know that a majority of families with unmarried parents are indeed families with missing father. By your definition, you have are dividing by number -1 . This will lead to a higher family income and less inequality for families with single parents. Of course, income among families with single parents is like 50% or lower than married families; the result of this nondimensionalization is reflected by your graph; little change in inequality for families with single parents, over time. I argue that you are using a data massaging that supports your predetermined model: inequality is worse among married families than with families with a single parent. I’m sorry, this is not correct. As the issue of bias against conservatives is coming here from time to time, I thought maybe this article would be of interests to blog visiters (and maybe even blog owner). An abstract: if you think there is no discrimination and no problem of discrimination, it means probably you are liberal doing the discrimination. I’m always amazed at how someone compares the ethnically diverse, mixed government, non-socialist 315 million people in the geographically immense United States with small, heterogenous virtually tribal, monarchies and parliamentary governments, with socialist and dictatorial governments, and populations smaller than our large cities in geographic areas smaller than our individual state with tax codes and property rights that don’t resemble ours at all. Wilcox and Lehrman obviously missed the lecture in “rational thinking 101” about the invalid nature of comparing apples and oranges. Dave – you join Vijay above in failing to grasp the point of the figure. Of course societies are different. The point is not to establish a relationship between gini and marriage – that would require actual research. The point is to demonstrate that there are cases in which low marriage rates coexist with low levels of inequality – and the reverse. 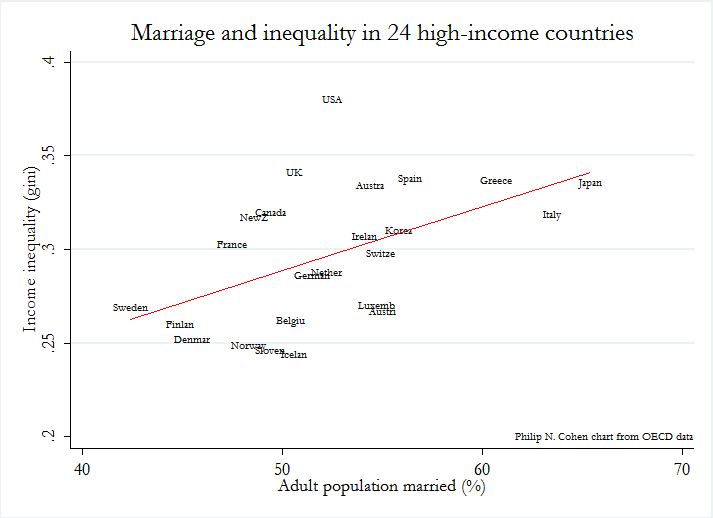 This is to undermine the simplistic assertion that low marriage rates necessarily imply high inequality.